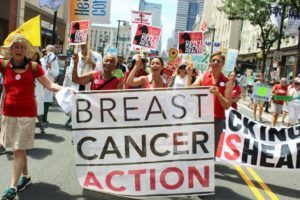 Breast Cancer Action is an outspoken, truth-telling, rapid response watchdog—just what you need from an activist organization at this critical moment. We’re in the middle of our spring fundraising drive and we need to raise $15,000. Because our board has offered a dollar for dollar match up to $5,000, your money will go further when you donate today. Members like YOU make our work possible. And we need you now, more than ever. We’re up against an administration that’s delivering on a corporate wish-list of deregulations that will gut public health protections and reduce access to essential, life-saving healthcare. Your gift funds our fight for a more just and healthier world—eliminating cancer-causing toxins, ensuring healthcare access for those who need it most, and upholding standards of safety and efficacy for breast cancer treatments. We don’t take money from companies that profit from cancer, which means we don’t ever have to choose between loyalty to corporate funders and taking a stand for women’s health. And that means we need you. Your donation of $25, $50, $100 or more funds our vital grassroots activism. In solidarity and with gratitude.